Gerry Adams said the “embarrassing u-turn” proved that James Reilly should not continue as health minister. 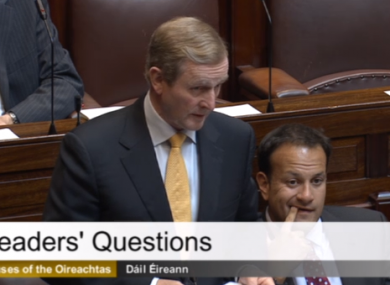 THE TAOISEACH HAS apologised to people with serious medical conditions who lost their discretionary medical cards. Enda Kenny said that the HSE’s eligibility review of cards “resulted in very many families being severely inconvenienced and for that I’m very sorry”. Earlier today, the health minister James Reilly said that over 15,000 cards would be given back to people who lost them during the review process. Speaking during Leaders’ Questions in the Dáil, Kenny said that he thought about 13,000 cards would be restored at a cost of €13 million. This matter is one that’s not as simple as it looks. Reilly said that the Cabinet had decided “to take remedial action to repair the unintended consequences” of the review process. Sinn Féin leader Gerry Adams said that it was unusual that “someone didn’t have the wit or social conscience to ask what the potential consequences would be” before the process began. When Adams said he did not receive answers for questions he asked in the Dáil last week about missing review files and the potential conflict of interest of Noel Daly, who has since resigned as the director of the West/North West Hospital Group, the Ceann Comhairle Seán Barrett intervened and told him to stick to one topic. Fianna Fáil leader Micheál Martin said that families who lost their medical cards had been put “through hell and back in terms of stress caused, anxiety caused”. Adams stated that this “embarrassing u-turn… is proof that you’re making up policy as you go along and that your minister [James Reilly] should go”. Kenny said he “very much” regretted the “stress” that has been caused to individuals. We’re not all perfect by any means and we recognise that. Email “'I'm very sorry': Enda Kenny apologies over medical card 'stress'”. Feedback on “'I'm very sorry': Enda Kenny apologies over medical card 'stress'”.